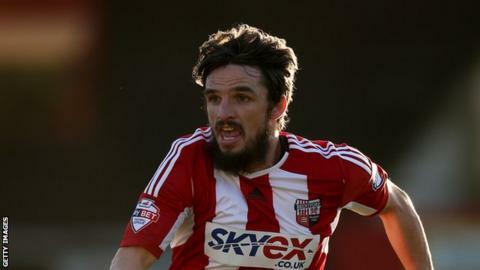 Ipswich's Jonathan Douglas says he will "be ready if the chance comes" to face former club Brentford on Saturday. The 33-year-old midfielder captained the Bees to the Championship play-off semi-finals last season before joining Ipswich earlier this week. "Things change, I'm at Ipswich now," he told BBC Radio Suffolk. "I'm looking forward to playing for them. "I probably wouldn't celebrate a goal, but obviously I want to win and it doesn't matter who it's against." Douglas made 187 appearances in all competitions for the Bees, scoring 17 goals during a four-year spell at Griffin Park. "The lads here have made me feel very welcome," he said. "I don't know any of them personally, just through playing against them, but over the years you get to know a few people. They've been very good to me here." Douglas will join former Republic of Ireland manager Mick McCarthy at Portman Road. "I think he tried to sign me once when I was at Leeds about six or seven years ago," he said. "But that's as far as it got, so I'm looking forward to working with him." Meanwhile, young Ipswich right-back Josh Emmanuel has signed a two-year professional contract with Town, with the option of a further 12-month stay.